A massive congratulations to Lynch-Bages, who this month won the Global Best of Wine Tourism Awards 2016. The Bordeaux Grand Cru Classe’s historic winery in Pauillac dates back to 1850, and Lynch-Bages also boast a fabulous Chateau-hotel and a double Michelin-starred restaurant in the heart of the Medoc vineyards. 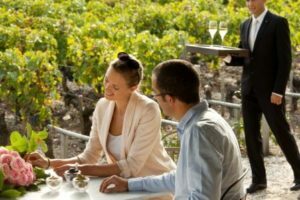 An absolute “must” for your 2016 bucket list, Grape Escapes offer two luxurious three and four day Hidden Gem breaks, which include accommodation at the 4* Chateau and a tour and tastings at Lynch-Bages, amongst many other exciting activities. See our Hidden Gem: Cordeillan-Bages page for detailed information and prices!